PES 2018 has officially been released worldwide. We’re going to go through each of the top 10 players by the main attributes. These will include passing, shooting, physicality, defence, speed and dribbling. We will also discuss how accurate we believe these ratings are. 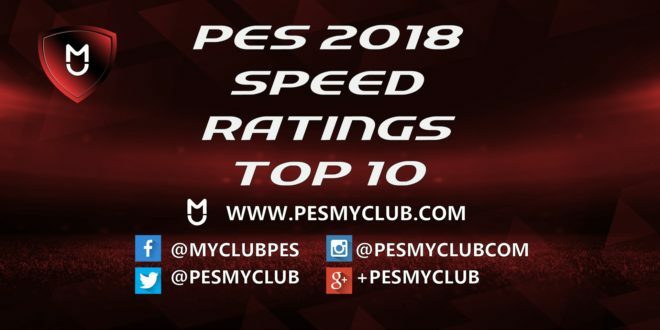 In this article we look at the top 10 PES 2018 speed players. Here are the current top 10 rated players for speed in PES 2018. These can be subject to change throughout the season. Are the PES 2018 Speed Ratings Correct? When it comes to ratings footballers speed there are always going to be disagreements. For some reason how fast a player is always invokes strong opinion. One thing we can all agree on however is that with the inclusion of Usain Bolt in PES 2018 he should definitely have a speed rating of 99. The Dortmund centre forward is fast. Is he the fastest “real” footballer on the game however? Many would argue not. He is rated 97 speed, two more than Gareth Bale, Leroy Sane, Hector Bellerin and Kevin Mbabu. The Arsenal right back has apparently shown in training he is comfortably faster than Theo Walcott. With that being said though he has rarely shown this speed in a game. Players such as Mohamed Salah, Sadio Mane and Ahmed Musa have showcased their speed in matches. This creates the question whether implemented speed should be rated higher than speed that isn’t used as often. Theo Walcott has been one of the fastest players in each PES game for nearly a decade. However, he rarely out paces players. He does so even less at this stage in his career. He is obviously still a pacey player but in 2017 a speed rating of 94 is far too generous.